Tran Van Thao is a prolific artist whose abstract works typically intertwine elements of urban landscapes with images of nature. His current series of paintings for this online exhibition marks a departure in Thao’s style and theme. These new works draw from matters of the heart and explore the sensual moments of the relationship between man and woman. These expressive works with their rough sketch-like style contain elements of eroticism and sexuality rarely pictured openly by Vietnamese artists. 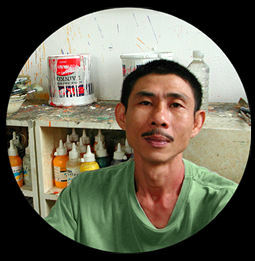 Graduating from the Ho Chi Minh City Fine Arts University in 1986, Thao has been exhibiting regularly during the 1990s and 2000, and has participated in numerous exhibitions overseas including in Europe, Asia and the USA. Thao has been twice selected as one of five artists to represent Vietnam in the annual Phillip Morris Association of Southeast Asian Nations (ASEAN) Art Competition. In 1995 he won the 2nd prize.